With everything the modern gadget freak has on their mind these days, is it any wonder that it’s easy to lose keys, wallets, remote controls, or just about anything else? According to recent statistics, the average person spends hours every year looking for lost things. That’s valuable time that can be spent doing more productive things, like reading coolestgadgets.com! The people at Melbourne Design in Australia have invented the Find One, Find All, a gadget which can help reduce the frustrating time trying to find your lost things. Using a radio transmitter/receiver that is capable to locating six different items, the Find One, Find All incorporates RFID style technology that is uniquely two way. That means that you can use any of the six items you choose to affix the FOFA Key Finder to find the others. So, if you lose your keys, but have your wallet, you can find your keys. 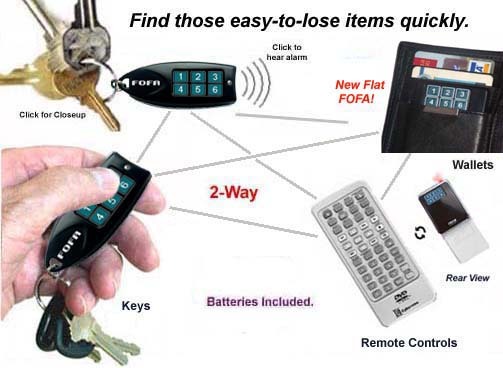 If you lose your remote control by have your keys, you can find your remote control. If you lose your wallet by have your remote control, your wallet is only a beep away. Powered by a thin nickle sized watched battery, the Find One Find all System is expandable to up to 36 FOFA Key Finders in one household or office. 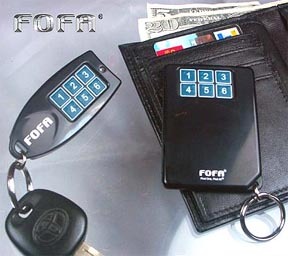 Cost is 24.95 for a set of two FOFA Key finders. The FOFA Wallet & Flat Remote Finders are an additional $12.47 and are smaller than a credit card and less than 1/4″ thick. I was very disappointed with this product…I have lost my keys a number of times and haven’t been able to find them. ITEM WORKS. FOUND MY KEYS SEVERALTIMES. ONLY DRAWBACK, ACTUAL RANGE W/THE 2 DEVICES IS 10′ OR SO, SO YOu NEED TO WALK THE HOUSE UNTIL YOU HEAR IT! ALSO THE BEEPING FROM IT COULD BE LOUDER. FAST DELIVERY. GOOD GIFT. WORTH THE $$.